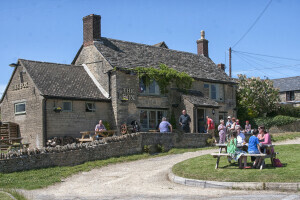 The Fox at Leafield, like many local pubs, has had to work hard to attract customers. It was closed from Spring 17 to April 18 and faced a difficult future. Then Joe and Mo came along with their many years’ experience in the trade (they ran the Cheshire Cheese pub in Little Essex Street, London for 10 years). They have re-carpeted the inside, added their own memorabilia, refurbished the toilets and got the log fire working again to give everyone a warm welcome in more ways than one. Outside, they have added new tables and a smoking cabin. They now serve excellent food from Wednesday to Saturday (I know because I have tasted it) and on Sunday they do a splendid full roast.